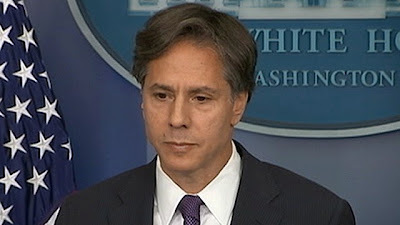 WASHINGTON, DC -- U.S. President Barack Obama's choice to fill the number two spot at the State Department, Anthony Blinken, spoke favourably on Wednesday about the possibility of providing weapons to Ukraine, which is grappling with pro-Russian separatists. Testifying at a congressional hearing on his nomination to be Obama's deputy secretary of state, Blinken said the administration should consider rethinking its policy of not providing lethal aid to Kiev. Ukraine. He accused Russia last week of sending soldiers and weapons to help separatist rebels in eastern Ukraine launch a new offensive in a conflict that has already killed more than 4,100 people. Increasing violence, truce violations and reports of unmarked armed convoys travelling from the direction of the Russian border have aroused fears a shaky truce could collapse. The fragile ceasefire in Ukraine is underpinned by the Minsk Accord, signed on Sept. 5 by Russia, Ukraine and rebels from the Ukrainian separatist regions of Donetsk and Luhansk. The North Atlantic Treaty Organization has also accused Russia, which annexed Crimea from Ukraine in March, of sending tanks and troops to eastern Ukraine in recent days to support the separatists. Russia, as always, denies this. "I believe that, given the serious Russian violations of the agreement that they signed, the Minsk Accord, that one element that could hopefully get them to think twice and deter them from further action is strengthening the capacity of the Ukrainian forces, including with defensive lethal equipment," Blinken said. "I think it is something that we should be looking at." Blinken noted that U.S. Vice President Joe Biden would visit Ukraine this week, and said he was sure providing lethal assistance would come up for discussion. In subsequent questioning, however, Blinken declined to say explicitly whether or not he himself favoured providing lethal assistance to Ukrainian forces.